In an important AFC matchup, the 4-0 Kansas City Chiefs travel to Houston to take on the Texans. Leveraging a suddenly dominant Alex Smith and the legs of rookie Kareem Hunt, the Chiefs look like the best team in the league. But Houston, led by their own rookie Deshaun Watson, just put up 57 points on the Titans and are hitting their stride. The defenses are solid in this matchup, but expect points and big plays in an exciting game. Alex Smith is the second highest scoring quarterback in standard fantasy football leagues so far this year. Tough to see that coming. He continues to be extremely efficient - he leads the league by a wide margin with a completion percentage of 76 - while also looking downfield. His 8.8 yards per attempt is third behind only Tom Brady and Jared Goff (2017 is weird.) Houston is one of the better defenses in the league but at his current clip, Smith represents a high floor QB1. Despite not reaching the end zone for the first time this year, Kareem Hunt still ran for 100 yards and had a productive day. Unfortunately, the offensive line injuries are beginning to pile up for Kansas City, they lost their center and right guard against the Redskins. Add to that the fact that Houston hasn't allowed a running back to gain over 40 yards since week one, and you should temper your expectations for Hunt. Tyreek Hill's week four performance represents why he is not a WR1. Without a big play, his floor remains painfully low. Houston has been excellent against the pass this year but are susceptible to lapses in coverage, something Hill can easily exploit. And Andy Reid will continue to find ways to get him the ball. He is a volatile option, but a high ceiling WR2. Travis Kelce carved up the Redskins defense to the tune of seven catches for 111 yards and a touchdown last week. Along with Gronk, he remains the elite option for fantasy tight ends. Houston is mediocre defending the position, ranking in the bottom third in yards allowed and yards per catch. Start Kelce with confidence. 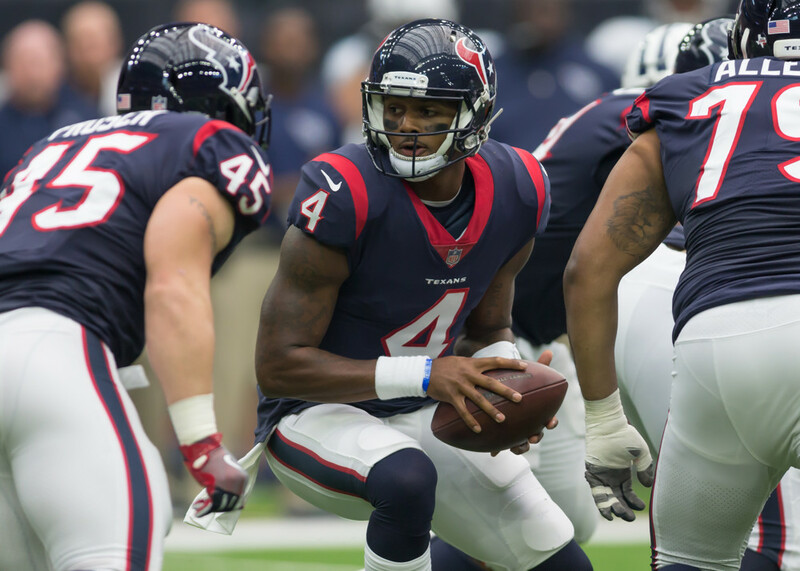 After a tough week one against the Jags, Deshaun Watson has been one of the best fantasy football quarterbacks in the league, culminating in a masterclass display against the Titans in week four. The Chiefs present a tough challenge, but Watson's legs should keep him in the QB1 conversation. After a 10 catch, 107 yard performance against Tennessee, DeAndre Hopkins looks on track for a monster year. He is leading the league in targets and has developed obvious chemistry with Deshaun Watson. The Chiefs have been good against the pass, but Hopkins will likely draw Terrance Mitchell, not highly regarded Marcus Peters in coverage. Hopkins is an obvious WR1. All those who stuck with Lamar Miller through three mediocre performances were rewarded handsomely with 75 rushing yards, 56 receiving yards and two touchdowns. The Texans offensive line is average at best, limiting Miller's weekly rushing output, but Kansas City is allowing 4.3 ypc on the season. Miller is a solid RB2 thanks mostly to volume. Will Fuller's return to the Texans offense added some much needed explosion, and Fuller cashed in on an instant connection to Deshaun Watson for two touchdowns. The sample size is small but Fuller represents an interesting flex option in week five. It is worth noting that he will likely draw Marcus Peters, so he is a true boom bust play. Ryan Griffin was about the only offensive player who didn't put up big numbers last week against the Titans. However, the Chiefs struggled to defend Vernon Davis last week and Bill O'Brien likes to use his tight ends. He is a potential streaming option if you are lacking a better play. Get Fantasy News and Analysis On Your Phone!